Why a Husband Should Always Take Gift Requests Seriously – Monkeys in my house! 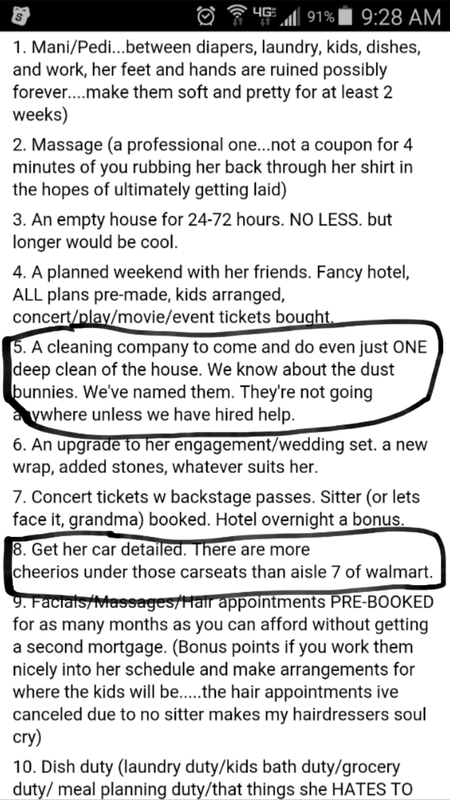 Two years ago, just before my birthday, I told my husband I wanted nothing but a cleaning lady for a day or my car detailed. Instead, I got another bag of chocolates and flowers. Don’t get me wrong. I wasn’t ungrateful, but I can buy chocolate anytime for myself and flowers die so quickly. Anyway, I was… upset, to say the least. I, uh, let him know how… upset I was and in no uncertain terms just how mistaken he had been. He then told me if that was what I really wanted, I could go ahead and find a cleaning lady and hire her. You have to understand, this man is not normally so insensitive. He’s used to me being practical. He bought me a Milwaukee drill for my previous birthday and I was thrilled! It never occurred to him that I was disguising a request for a day off from daily drudgery. We are still married. I have not referred back to this particular incident, except for a couple of necessary occasions. Someday, I’ll get that cleaning lady or my car detailed. So ME!! I think my hubs will get a chain saw for his b-day because i sure want one!!! My love language is acts of service, and I don’t think I’m very good at gift giving either, I’m just too practical! But I knew my husband was a keeper when one of the first gift he gave me was my very own tool set! It took a couple years before he bought me the super-amazing-neon-green tool chest, that I love! But I have to say, I use the tools a whole lot more than a vase of flowers! I’m jealous you got a tool chest!